Sports Medicine Archives - Dr. Jeff Stickney, M.D. Summer 2018 has arrived and World Cup fever is in the air. While we certainly see our share of flops in these matches, many players endure legitimate injuries too. Those same injuries will be happening to people everywhere this summer as we spend more time being active outside. Reviewing these common sports injuries, their symptoms, and prevention tactics will ensure you know how to stay safe and keep the ball rolling. 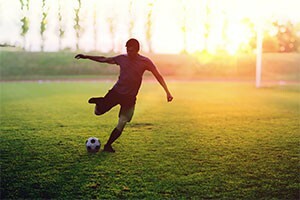 Soccer players possess the remarkable ability to run nearly nonstop for 90 minutes. However, their effort often comes at a price, especially when warm weather factors in. Groin pulls, thigh strains, and calf cramps are among the most prevalent injuries we see, and they often result from overuse and dehydration. Make sure to stay drink plenty of water, wear the correct equipment, and listen to your body while exercising, especially in the heat. Bending your muscles, ligaments, and joints by stretching regularly will help you “bend it” like the pros. Injuries such as shin splints, ACL tears, and Achilles tendinitis aggravate when athletes don’t stretch or rush back into action too soon. Condition yourself by starting at a low-intensity level and gradually increasing to allow your body to adjust rather than straining its limits. Care for these injuries with rest, ice, and elevation – or call an orthopedic doctor for further evaluation if pain persists. Soccer, like other summer activities, requires sharp cutting, quick stops, and pivoting. These sudden movements lead to some of the most notable injuries we see in World Cup matches and during summer– ACL tears and ankle sprains. They can occur without contact and may require surgery depending on severity. Take precaution by strength training, wearing the correct footwear, and practicing the proper technique for whatever exercise you choose. Dr. Stickney, a Kirkland orthopedic surgeon, is an expert in exercise and health, shoulder replacement surgery, sports medicine and more. Contact Dr. Stickney and return to your healthy, pain-free lifestyle! For many people, one of the most frustrating aspects of recovering from surgery or an injury is returning to their former level of performance. To overcome these hurdles, champion athletes are honing a different muscle: their brain. By sharpening their confidence, motivation, and the mind-body connection, they’re able to surpass previous limits, and, now, research suggests this is a feasible option for amateur and casual athletes facing physical obstacles. If you’re struggling with an exercise or activity after joint replacement surgery, it can be tempting to indulge in harsh self-talk. However, this can significantly impede your progress and fuel a cycle of negativity. Sports psychologist Justin Ross instead recommends writing down how you feel while exercising, when things became difficult, and how these feelings shaped your performance. Positive affirmations can also be a productive way to end an activity, reminding yourself of how much progress you’ve made and how much your body has accomplished. Take time to imagine what you’re going to do, whether that’s walking up a hill or running in a marathon, and focus on the positive outcomes. Joanna Zeiger, a former Olympic triathlete, suggests visualizing the moment when you reach your goal after all of your hard work. To ensure that becomes a reality, she also says to imagine worst-case scenarios to mentally prepare yourself for incidents and plan how you would overcome them. Treat the brain like you would any other muscle and give it time to rest and recover. Don’t stress if your performance didn’t match your goals, and don’t focus on the results every time you exercise. Given proper breaks, your brain can function at its optimal level and keep you positive, strong, and determined as you return to a regular exercise routine. Suffering from joint pain? Dr. Stickney, a Kirkland orthopedic surgeon who specializes in procedures including ACL rehabilitation and total knee replacement, can help you find the surgical or nonsurgical option that will allow you to return to an active lifestyle. Did you know that just like the rest of your body, the brain also requires physical exercise for its healthy development and functioning? According to the findings of an exceptional study recently conducted on rats, some kinds of exercise could have a larger bulking-up impact on our brains than others. For the first time ever, researchers compared head-to-head the neurological effect of various forms of exercise: running, weight-lifting and high-intensity interval training, with the astonishing findings suggesting that training hard may actually not be the best choice for the long-term health of our brains. Occasional bumps and bruises are expected when kids play sports, but for more than 1.35 million children last year a sports-related injury was severe enough to send them to a hospital emergency department. Sprains and strains, fractures, contusions, abrasions and concussions top the list of sports-related ER diagnoses for kids ages 6 to 19 — at a cost of more than $935 million each year, according to a report out Tuesday from the non-profit advocacy group Safe Kids Worldwide. Osteoporosis is a serious health issue that mainly affects postmenopausal women. Now, a Spanish study has confirmed that doing exercise during puberty can improve bone health in adulthood. In this scope, sports such as football, handball and basketball are better than others such as swimming. Once considered an adult injury, ACL tears are occurring more often in the legs of elementary and middle school-age children, orthopedic specialists report. The increase, which stems in part from better diagnostic tools and a dramatic increase in children playing competitive, organized sports, has created a vexing problem: What is the best way to fix it? For years, doctors have advised delaying surgery until the bones are finished growing, usually around age 14 for girls and 16 for boys. In the meantime, children were prescribed physical therapy and encouraged to remain active while using a knee brace, with the exception of cutting, pivoting and contact sports. But postponing surgery hasn’t worked very well, in part because it’s difficult to keep children from further damaging the knee while they wait, In some cases for years. Athletic youngsters often must stop playing sports they love, a loss that can lead to depression and affect a child’s identity and friendships. The ACL, which connects the thigh bones and shinbones inside the knee joint, is a crucial stabilizer during sports like basketball, football, soccer and lacrosse. Its job is to protect the knee from shifting, rotating and hyperextending as an athlete runs, jumps or lands. An easy way to tear the ligament involves simultaneously decelerating and twisting. In adults, surgery is not always necessary, especially for those with sedentary lifestyles. Though skiing and soccer might be out, it is possible to walk, run and even play tennis with a fully torn ACL. Risks are higher for children because it is hard to get them to modify their activity. A study published last year in The American Journal of Sports Medicine found that young athletes who delay surgery five months or more have a higher chance of suffering a secondary knee injury. Waiting can lead to progressive damage to other parts of the knee, including the meniscus and cartilage, multiple studies show. Though official statistics are scarce, orthopedic specialists estimate that thousands of children and teens are tearing their ACLs each year. 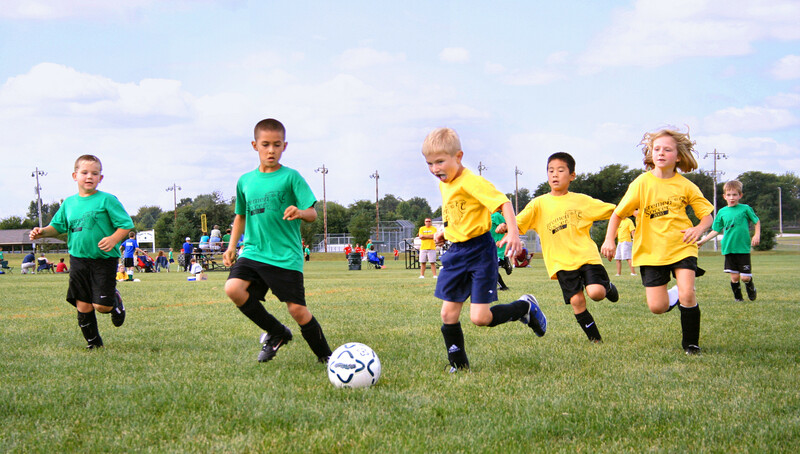 Researchers at Children’s Hospital of Philadelphia found a 400 percent increase in youth ACL injuries over the last decade, according to findings presented at the American Academy of Pediatrics 2011 annual meeting. Girls have up to eight times the risk of an ACL tear as boys; though no one knows exactly why. 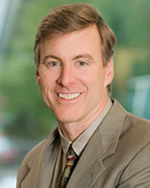 Dr. Stickney specializes in hip, knee and shoulder surgery in his Kirkland and Redmond locations. If you are experiencing knee issues or have questions about treatment options, contact our office to schedule your next appointment! Watch Dr. Stickney’s video and learn more about orthopedic surgery.